Pherim wrote: Extrude Edges by Faces by Rails makes my SU2015 64bit always crash immediately after finishing - it works fine on the same model in SU2013. No error message, just crash and bug splat window the second I click yes or no to erasing the original curves. It's amazing though, how much faster this and many other operations are executed in the new 64bit version. Looks like we ought to continue this issue in this 'Extrusion Tools' thread ? Your recommendation in the other thread made me try out every tool in this set, and that's how I discovered this issue. Sorry for keeping you busy like this. I confirm that it works now. Thanks! I have just installed this plugin through plugin store tool bar's autoinstall. I watched the video on youtube and followed step by step. but the tools didn't work for me. Is there any way there could be a more detailed video tutorial preferably with audio? Also am I missing something in the operations and or installation of this tool? I have downloaded the TIG Extrude tools to SketchUp. Unfortunately I can not find the toolbar..
You said you downloaded the RBZ. You have NOT said you have installed it ! NOTE: if you installed it with the SketchUcation PluginStore Toolset's dialog within SketchUp itself it should Auto-Install. If none of this works come back. Whenever I extrude an edge, by any means, and save, it undoes the extrusion and will continue to undo every time I save. It acts just like Ctrl-Z whenever I hit Ctrl-S, and it crashes occasionally. Thank you. It was working fine. Ok, I figured it out. Extrude Tools have a conflict with SUSolid plugin. I really need both. I am emailing the dev of SUSolid now. Is there anything I can send you to check on your end? Thank you. I'm new to this tool. I was just using the 'Extrude edges by Rails by face' tool when i realised that the ribs produced in my model by selecting the Profiles and rails option were quite different from the one shown in the tutorial. They weren't so smooth or so detailed but rather plain and conflicting. I'm attaching the pictures of the required rib formation titled 'A' versus the ribs produced in my model titled 'B'. I know the two shapes are quite different but that doesn't explain why the rib designs are different. Last edited by Fabtins on Sun Jun 28, 2015 10:40 am, edited 1 time in total. You could help us help you if you posted the SKP file you're working with. Otherwise we'll just be guessing. Posting the SKPs would be a great help [purge first]. It's hard to tell what shape you have defined for the extrusion face[s]. The profile used in example 'A' was not a rectangle ? It looks like a '+' shape, or a 4-pointed star ?? The 'B' profile is a rectangle and it is sized quite near the curve segment size too, so there are much smaller 'gaps'. I've used the '4-pointed star' shape in this sketchup file sir. This shape, i've scaled and there are adequate gaps but the results are drastically different. The mesh formed isn't at all the same. Also there is the persisting issue of mesh design. It's still rather plain compared to the elaborate and realistic design formed in your tutorial. What is made is what's to be expected using the profile and paths in your example SKP. The shape of the face determines the extrusion's cross-section. The cpoint [guide-point] selected with the face determines its setting out relative to the path [if included, otherwise the face's bounds.center is used]. Fabtins wrote: I've used the '4-pointed star' shape in this sketchup file sir. This shape, i've scaled and there are adequate gaps but the results are drastically different. The mesh formed isn't at all the same. 4 pointed star shape??? You mean, a RECTANGLE? Like you selected the Polygon Tool Shape and input 4 for four sides... which obviously results in a square? Then you scaled it so it became a RECTANGLE??? behold... using a different face shape... it resulted in different rails and profiles! Fabtins wrote: I've used the '4-pointed star' shape in this sketchup file sir. 4 pointed star shape??? You mean, a RECTANGLE? Huh. You learn something every day. I never knew a rectangle could be called a 4-pointed star. I think of this for "star". Yes, that would be my guess too. However, there is no shape like that at all in the file he shared with us. He used the rectangle as the shape. I can´t think of another reason for him to say he wanted a four pointed star shape when there is none in his Sketchup file. edit: hovering the mouse over his nickname, it shows his name (Pranjal) which I guess is from India. There shouldn´t be such difference from Hindi to english for his word for "rectangle" to be translated as "4 pointed star". So I really do not know... maybe there was a four pointed star bitmap on that rectangle? Thank you gentlemen! I guess that answers my queries. 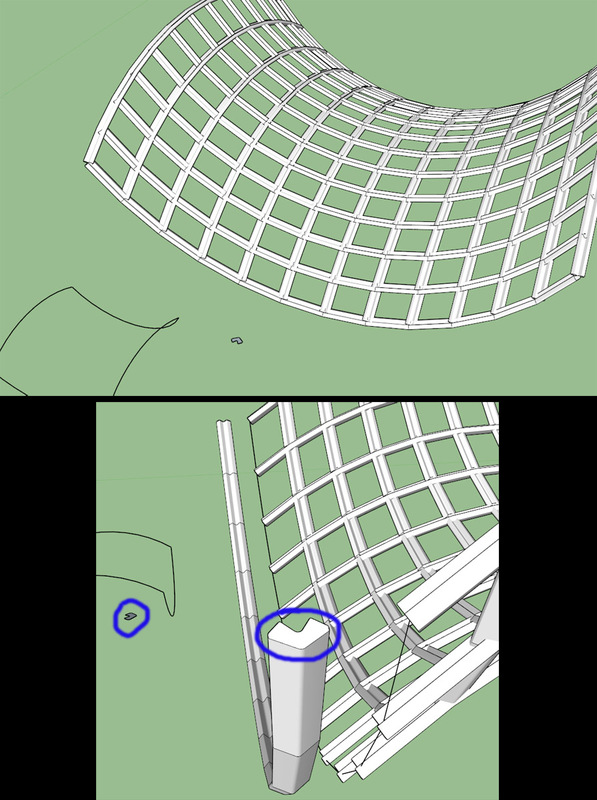 As i said in my first post i m pretty much a newbee when it comes to extrude tools or for that matter sketchup in general. I hadn't known that the shape of the flat face had any bearing on the profile in the rails(Thought it was just supposed to be that i.e., a flat face nothing more) or that if we divide the number of segments of the curve edge then it affects the number of ribs as well. Thanks a lot. Incidentally, the 'four pointed star' thing wasn't my production. I was merely quoting what line of terms TIG had used previously referring to example 'A'. Note that y'all, if you will. As you deftly pointed out Aceshigh, the rectangle term is 'indo'-european AND assuming I am an Indian, i'm the last person to harbour any doubts about what a rectangle(a polygon enclosed by four sides at right angles to each other) or a star(a polygon with sides cutting each other so as to form a star shaped figure)mean. Fabtins wrote: Thank you gentlemen! I guess that answers my queries. 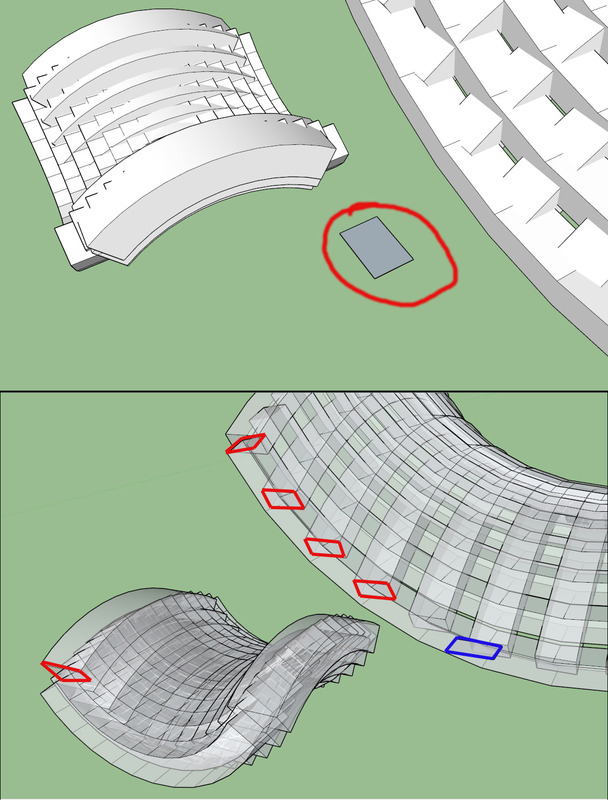 As i said in my first post i m pretty much a newbee when it comes to extrude tools or for that matter sketchup in general. I hadn't known that the shape of the flat face had any bearing on the profile in the rails(Thought it was just supposed to be that i.e., a flat face nothing more) or that if we divide the number of segments of the curve edge then it affects the number of ribs as well. Thanks a lot. I do not doubt for a second that Indians, who excell in mathematics since antiquity, can differentiate between a star shape and a rectangle. What I was wondering was if perhaps you were from some part of India where only some local dialect was spoken and not much english at all, so the TRANSLATION (via Google or something else) was problematic. While we're at it, can you name this plugin you mentioned in the last para? The one that "cuts" a shape following the patterns it recognizes in the bitmap? Fabtins wrote: While we're at it, can you name this plugin you mentioned in the last para? The one that "cuts" a shape following the patterns it recognizes in the bitmap? How do you actually make these into a solid? gonashvili wrote: How do you actually make these into a solid? How do you make what into a solid? Please be specific. Hi Tig, I've just noticed that the icon for extrude edges by vector is replaced by the icon from extrude edges by lathe.